That is what the Qur’an is – a living miracle in mortal human hands. Its very name is a wonder to behold. For, it is called the Qur’an, which means reading, something to read, the thing to be read. Anyone who studies the Qur’an with any sincerity and seriousness can see the miracles that are contained in every page and passage of the Qur’an. That is why passages of the Qur’an are called Aayats because of their being divine and miraculous signs. In fact everything about the Qur’an is a miracle. The fact that a book should be delivered to the world by a man without the ability to read or write is a miracle. The fact that such a book should be referred to by the title of Qur’an – Reading – is a miracle. The fact that such a book should begin with a proclamation of its being a book of guidance is a miracle. The fact that 1400 years before much of the rest of the world woke up to it, this book should be using gender inclusive expressions like “The Human Being” is a miracle. The fact that hundreds of years before much of the rest of the world even knew what it was, this book should be using an expression like “The People” – not Mankind but “The People” – is a miracle. The fact that 1400 years ago this book should declare men and women equal in rights and rewards is a miracle. The fact that this book should have a chapter called “The Women” and another chapter called “The People” and yet another chapter called “The Pen” is a miracle. The fact that this book is still in exactly the same shape and form in which it was originally delivered 1400 years ago is a miracle. The fact that this book has a chapter called “Maryam” – Mary, the blessed mother of Jesus, God bless him – is a miracle. The fact that this book most eloquently and powerfully defends the virgin birth of Jesus, God bless him, is a miracle. The fact that this book takes the side of Moses, God bless him, against the Egyptian Pharaoh, is a Miracle. The fact that this book sides with the Christian Romans against the Pagan Persians and their Pagan Arab admirers is a miracle. The fact that this book, all 6666 Aayats – passages – of it, is memorized cover to cover by millions of people to this day is a miracle. The fact that this book is recited verbatim five times a day all over the world is a miracle. At a time when reading was mostly the prerogative of the rich and the powerful, the royals and the nobles, the clerics and the priests, and at a time when the common man was often forbidden from reading, at times on pain of death, the Qur’an issued a clarion for all people to read. What could be a greater miracle than that? These are just some examples of how miracles abound in the Qur’an. Otherwise, everything about the Qur’an – its form, its content, its history and its place in the modern world – is a miracle. In fact, it is fair to say that the story of the world for the past 1400 years is one of the greatest miracles of the Qur’an. For, it is a story of the world trying to catch up with the Qur’an and its teachings. All one needs to see the miracles of the Qur’an, and to cry out that Qur’an is indeed the word of God, is a clean and pure heart, an inquiring mind, an independent and noble spirit and an element of common sense and clear thinking. It does not matter what one’s age, gender, education, politics or “religion” is. Come and find out how the Qur’an is divine guidance for those who care, and how it is a light to illumine all aspects of human life, and how it is a cure for all that ails the human heart and vitiates the human condition. Attend the Qur’an Program that has been offered by Dr. Pasha on either side of the Atlantic. In this program, Dr. Pasha uses the language of the Qur’an to directly and personally connect the participants with the Qur’an. He also uses Islamic as well as Western and other knowledge and scholarship from around the world to make the meaning of the Qur’an clear. The result is a highly absorbing and interactive program which makes the Aayaat of the Qur’an come alive to the participants. And yet no prior knowledge of the Arabic language is required. All you need is a copy of the Qur’an with translation – and a positive and respectful attitude. For, without a proper attitude, you will learn nothing, see nothing, feel nothing, and will leave the program with nothing. The Qur’an will freeze up on you and you will come out cold and dazed. 1. Falling in love with the Qur’an. 2. Miracles in the Qur’an. 3. Protection from Evil, Part II. 4. Calling Allah, Part II. So, come and join us in the Qur’an Program! And join us in the Qur’an Campaign that is being launched to take Qur’an to every home and heart that needs it. God bless all! May his mercy envelop all – and it does! AOL [dot] com or www.IslamicSolutions.com. And It Is a Label Made in Heaven! Muslims Are the True Patriots! For, That Is Islam!A Concept Called "Feedback"Want to Know Islam? Caught between Islam and Jahiliyyah! It Is Tough Being a Muslim!Muslims Awaken to a New Year of TyrannyPursuing a Couple of Projects All My LifeMuslims Cannot Be Error-Free! That Is Not How the System Is Designed! But Why Not Call It What It Really Is? And an Obligation We Cannot Escape?It Is Always One Man that Makes the Difference! And Changes the World!Muharram Is the Month of Peace! And Not Just for Muslims! And Muharram Is also a Time for Muslims to Repent!Reason Why People May Be More Afraid of Hurricane Irma Than They Are of the God of Hurricane IrmaThe Wrath of Hurricane Irma!Nation Building Is What Islam Is All About! And That Is What Muslims Are Supposed To Do! Part of Dr. Pasha's Letter to a BusinessmanModern-Day Cries of "Muslim Unity!" How Tyrants and Dictators Silent Honest DissentThe Fire in My Heart! An Explanation of Who We Are, and Why We Do What We Do, and Why We Do Them the Way We Do Them!A Letter to a Christian PriestSome of the Skills the Qur'an TeachesWant to Know What It Is to Work for Allah? Come, Let Me Tell You!The Purpose behind Our Writings. That Is What I Do! Advice to a University StudentTo May 2017 Graduates: A Message from Dr. PashaHow We Approach and Recruit People for AllahMr. Yusuf Ali of the English Translation of the Qur'anAs Martin Niemoller Would Put It -- Perhaps!A “Muslim” Did It? But Then What Did the Other Muslims Do?Breaking the E-Mail BondGeneral Flynn Must Go!Muslims, Democrats, Republican Establishment! Muslims Must Make Their ChoiceTrump Is a Continuation of the Obama-Sanders Revolution!The True Nature of Our WorkQur'an Program: An Invitation to a FriendAllah Is Always Ready -- And Willing And Able! Working for Allah Series -- Whatever the Number!Just Say Al-Hamdulillah! Dr. Pasha's Thanksgiving Message: 2016! Filled with Men and Women Without Character. So Will Go the Ummah -- The Islamic NationHow Little We Know or Understand Shaitan!Have Iman? Including the “Poor Muslim Kids” of India!Kaana Yakoonu Fee Mihnati Ahlih!Whodunnit? Why Don’t You All Do a Complete Daily Khatm of Qur’an? How Many Issues Does It Take To Make One Issue?Got Worries? Don't Worry: We Got Solutions!Safest Place on God’s Earth! Or Is It? Presidential Primaries, 2016: Bernie’s BoobooA Divine Equation Unlike Any!Just Say Al-Hamdu Lillah! With Subhaanallah Thrown in for Good Measure!ASM: Correct Your Error! Dr. Pasha Calls on American Society of Microbiology to Acknowledge Debt to Qur’an – and MuslimsIslam & Politics: Different, Related or Same?Help Save the World: A Call to Action by Dr. Pasha!Muslims, Messengers of Peace!How God Almighty Changes the World by Changing Technology – and by Changing the Way Humans Communicate!This Business of Doing Islam!What Gods and Ilaahs Do We All Worship? Thoughts on Human Equality and LeadershipMysteries of a Meeting with God in Sajdah: One-on-OneThis Hajj, Let Muslims Re-Learn the Lesson of Human Equality!Love, Not Hate Is The Answer!This Co-Worker Family of OursIslam and European Colonization: A Tale of Two Contrasting CulturesWind at Your BackHillary Clinton, Republicans & American Presidency 2016Muslims Being Muslim in KeralaWhy Do Muslims Write? And Give Speeches?God's Earth Awaits the Muslim Response!Allah's path is clear -- straightOn the Road with the Qur'an: A Personal ExperienceWorld Day of God - 2015/1436Working for Allah Is Full-Time Business. Why Will You Not Help Your Brother?A “Muslim” Did It? A Program about Islam, Muslims and the World — Unlike Any!Think! For, Islam Is about Thinking. And It Is about Understanding!World Day of Fasting 2014/Ramadan 1435Dr. Pasha Issues Call for Floating Annual Mall DayHaving Faith in a Modern-Day MiracleA World Day of God ResponseDid You Know?Here Is Some of What Islam Gave the WorldRed Wine and Heart Health! Proof, Proof, Proof, Even More Proof!How Fast Should We Work When We Are Working for Allah?Three Slogans Every Muslim Must Learn and TeachUrgent! And Personal Integrity of those Working for AllahA Concept Called AccountabilityOur Profile in the Qur'anNeed for New Literature The Radiant One: Azzahraa’Islam vs. Anti-Islam: A Model You Can UseTwo Realities: Visible and InvisibleThe Fatwa that Cannot Be GivenMuslim Conferences: Who Picks Their Topics?The Converts Are a-ComingWhat but Perfection Can Come Down from the Most Perfect God?Are Transliterations of the Qur’an Haram?This Eidul Adwhaa, 1434/2013, Let Us Teach the World to Say “No!” to Evil!Character -- In and Outside IslamWhen Those Who Say They Work for Allah Also Say in the Same Breath They Are Fed Up with Those They Are Working to Invite to Allah?Why Did the Chicken Cross the Road?Crime & Punishment in Egypt and International LawEid Mubarak! - Eidul Adwhaa 1434/2013Halal and Haram in Islam? Let Me Tell You!Want to Know What Really Is Haram? Will You Submit?Leadership Fatigue, Did You Say?Motivations and IntentionsA Different Kind of Islam?Muslims and the Lost Art of ReadingChallenge before Humans: Doing What God Told Us to DoThinking about God!Work to Reduce DistancesNothing but GodWho Is in Charge?Shari’ah - and Jihad - on American ElectionsIslam Is Project ManagementPower of Prayer and SupplicationTELLING THE WORLD ABOUT ISLAM: Allah's Help Is Always There!Not Just Your God, or Qur’an, or Prophet, Sallallahu Alaihi wa Sallam, But Everybody’s!Ikhwan: 15,000 Years behind Bars?This Is What Islam TeachesBeware the Law of CoincidencesAll Work Is Allah’s Work - And All Work Is Jihad Those Who Fight Allah's DeenBashar Al-Assad, Be Gone!Lawful vs. Unlawful GovernmentsBashar Al-Assad Must Go!Dr. Firdaus Tells World Muslims: “Do Weekly Khatm between Now and Next Ramadan!”Iron Law of CoincidencesIslamic Egypt in PerspectiveEid Greetings to All on This Most Blessed and Wonderful Eidul Fitr: 1433/2012What Is Keeping Muslims from This Dhikr?Islamic Uprisings Herald New Islamic MillenniumBadr!Dr. Pasha Calls for Grand Global Khatm-a-Day for Ramadan 1434For Those Working for Allah, Some Goals to Pursue in LifeThinking and Talking God: A Common Muslim-Non-Muslim ProblemMutual Self-Help: A Social Obligation in IslamIslam Is Pursuit of Perfection on EarthFaiths of the World Unite! [Message 1 by Dr. Pasha]You Must Read That Book!A World Day of God ResponseGod Bless All! Eid Greeting from Dr. Pasha Eidul Fitr 1431/Ramadan 2010Do They Even Know What Islam Is?An Important Clarification from Dr. PashaMuslim OilIslam: A Quick IntroductionTaking the Qur’an to Every Home and Heart that Needs It!God in World Cup Football - Or Is It Soccer?Drive-by Experts on IslamYou Must Know This Man!If You Are Muslim, You Must Vote!What Does God Want from Us?Reflections on IslamChoosing AllahSome Core Concepts in Islam - Part IIISome Core Concepts in Islam - Part IISome Core Concepts in Islam - Part IEid Mubarak!Whither American Muslims?Amazing People of an Amazing LandWhither Indian Muslims - Third and Last PartWhither Indian Muslims - Part TwoWhither Indian Muslims - Part OneCIA’s Muslim Black SitesIf It Is Extreme, It Is Not Islam!Muhammad: The Living Miracle of Peace and Blessings - Sallallahu Alaihi wa Sallam!Islam Gave the World the Gift of LibertyPeace, Love and Hope for Humanity! An Eid Greeting to All from Dr. Pasha and www.IslamicSolutions.com FamilyPeace and Love: Season's Greetings from Dr. PashaA Ramadan Greeting From Dr. PashaIslam Gave the World Monotheism and EducationNational Qur'an Literacy Camp in the Caribbean: Taking the Qur'an to Every Home and Heart that Needs It!Islam Came To Set Humanity FreeA Formula for SuccessOf Human BondageAmerican Presidential Elections: Reflections on Hillary Clinton's Florida Primary "Victory"Miracle of Double Testimony: What Muslims Must Do To Qualify as Muslims?Hudoodullah: ProportionalityIslam and Muslims in Beautiful CaribbeanIslam Is All about Communication“Mutual Aggression”: Human Nature and the Need for Divine GuidanceA New Year's ResolutionDid You Say “Christian Islam”? Sorry, Does Not Compute!Peace and Love: Season's Greetings 1428/2007Pasha Hour International: Live from America! December 18, 2007Pasha Hour International: Live from America! December 8, 2007Divali, Thanksgiving, Christmas! It Is Us! It Is Us! It Is Us!Continuity and Change in IslamQur’an: Key to World PeaceMuslims' Abuse of Islamic CultureThe Miracle of "Smart Salaam"Should the Pope Apologize?Continuing the Story of Miracles in Islam IIAllah's Boundaries: What a Glorious Concept!The Miracle of the "Unlettered Man" in the BibleIslam the "Peaceful Religion"The Miracle of "You the People! "Continuing The Story of Miracles In Islam - IThe Pope and the Prophet, Sallallahu Alaihi wa Sallam!Unveiling the Truth behind the VeilThe Simple Miracles of IslamRemembering the Prophet, Sallallahu Alaihi wa Sallam!Payaam-e-Maghrib = Payaam-e-Mashriq = Payaam-e-Qur'an?Feedback on Dr. Pasha's International Qur'an ProgramIf Not Allah, Then Who?What Payaam are We Talking About?A Perspective on Islamic Projects and ActivitiesE-Group Letter #13Some Topics Related to the Qur'anE-Group Letter #12Are Elections Haram? Says Who? And Based on What? Part 8Are Elections Haram? Says Who? And Based on What? Part 7E-Group Letter #11E-Group Letter #10E-Group Letter #9E-Group Letter #8E-Group Letter #7E-Group Letter #6Dhikr AllahAre Elections Haram? Says Who? And Based on What? Part 6E-Group Letter #5E-Group Letter #4E-Group Letter #3Are Elections Haram? Says Who? And Based on What? 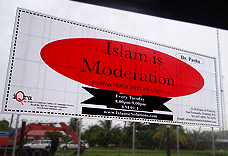 Part 5Crime in Trinidad - An Instrument of Personal ProtectionA Five-Point Plan of Self-Protection against CrimeLet Us Reconnect with the Qur’an!Are Elections Haram? Says Who? And Based on What? Part 4Using Aqeedah to Tyrannize the Muslim Mind in UK - The Case of HalifaxA Time to Pray and A Time to ActDr. Pasha’s Qur’an ScaleWhat God Do Muslims Worship?Discover the Qur'an - A Reality CheckStatement of Purpose: Dr. Pasha's International Qur'an ProgramQur'an: A Living Miracle in Mortal Human HandsAre Elections Haram? Says Who? And Based on What? Part 3Are Elections Haram? Says Who? And Based on What? Part 2E-Group Letter #2E-Group Letter #1The Jum'ah Khutbah - Allah's Special Gift to the MuslimsAn English Translation of Surah Al-FaatihahConferences and Speakers: A Partial PrimerHow to Read a Translation of the Qur'anAn Instrument of Personal ProtectionBut who in the World is or was Iqbal?Oldham Clean-up ResponsePresenting Islam to Non-Muslims - The Role of the MasjidWhat Are We Doing With These Words Anyway? Dr. Pasha Calls for World Day of Qur’an for Universal Male-Female Literacy! Rasulullah, Sallallahu Alaihi wa Sallam, tells us that Du’a that is made after reading the Qur’an is accepted. Taking the Qur’an to Every Home and Heart that Needs It! National Qur’an Literacy Camp in the Caribbean: Taking the Qur’an to Every Home and Heart that Needs It! Get Involved, Start the Qur’an Program in Your Area – Here is How! Let Us Reconnect with the Qur’an! The topics below have been covered in the past Qur'an program or they will be covered in the future program, In-sha'Allah. Topics will be repeated as needed. Why Do We Worry So Much about Typos – And other Errors in Our Writings?